The right music always adds to the cooking experience . . . I received in the mail today the new Fleur Jack CD, who is a Kiwi singer/song writer and friend currently living in The States. I stuck the CD in my computer, put it on repeat, and danced my way (wine glass in hand) through this recipe for Puff Pastry Pockets, originally from the Baking Makes Things Better blog. This was the perfect simple recipe for the end of a work day, that used up many of the ingredients I had around the house. 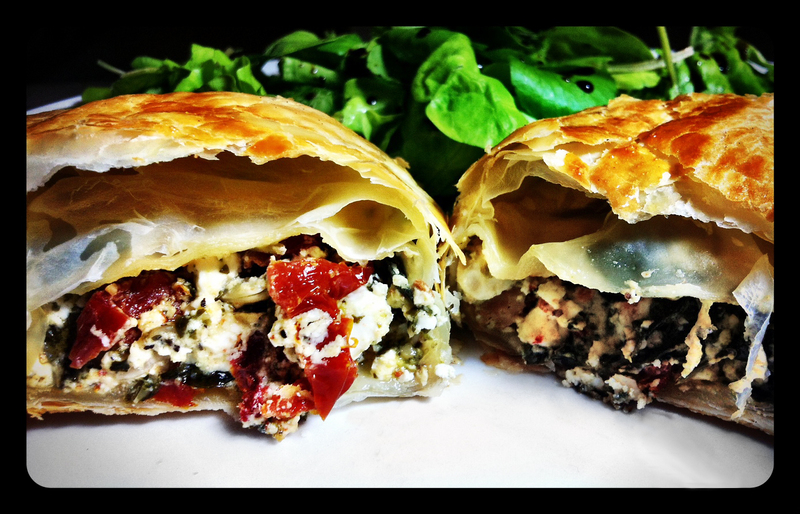 The recipe called for filling the puff pastry with feta, pesto, and sundried tomato, but I added spinach and spring onion/green onion into the mix. There are countless other variation you could do on this as well, to help clean out your refrigerator. I can imagine roast pumpkin, potato, kumara, red peppers, capers, carrot, mushrooms, onion, lentils or other beans, chickpeas, and other kinds of cheese all being great alternatives to the filling I chose. Puff pastry is not something I have ever tried making myself, although it is on the bucket list. Making puff pastry from scratch is a time consuming delicate process that can very easily go wrong, and it is an ingredient readily available in the freezer section of most super markets. As a vegetarian you have to be careful though, as most pre-made versions use lard or other animal fats. In New Zealand, New Way brand puff pastry is the only one that is vegetarian friendly, and even has the New Zealand Vegetarian Society stamp of approval. Preheat the oven to 200 C of 400 F, use the fan bake setting if you have one. Brush a baking sheet with olive oil. Cut each of the pastry squares in half. In a medium bowl mix together the feta, pesto, sun-dried tomato, spinach, green onion, plus a sprinkling of black pepper. filing in. They should look like giant ravioli. Brush the tops with the egg then bake for 20 minutes until golden. Serve, while warm, with a simple side salad, or these will also make a great lunch for the next day.